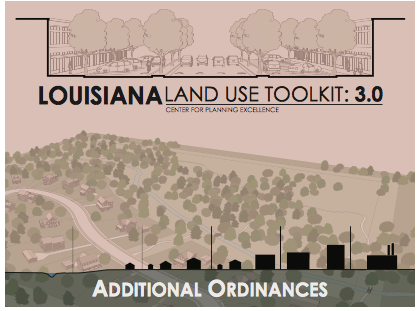 Download the complete Louisiana Land Use Toolkit to customize and implement in your community. The Toolkit is intended to be used in two ways. At its simplest, the Toolkit is a standalone zoning or subdivision code, or a cafeteria-style set of growth management tools that can be selected individually to meet specific needs. In its more complete form, the Toolkit can be combined and customized to build a complete development code. The Implementation Handbook is the starting point and should be consulted before beginning the implementation process. The Zoning Code module includes zoning districts, building types, allowed uses and basic parking and landscaping standards. The Zoning Code module should be used by communities who do not currently have zoning or who want to replace their current zoning. The Subdivision Code module includes the basic block, street and utility requirements needed for the subdivision of land. The Subdivision Code module should be used by communities not ready for zoning but still need basic rules to for development. The Additional Ordinances module contains rules for specific components such as signs, historic preservation, landscaping and parking. The Additional Ordinances module should be used by communities that already have zoning or are looking for enhanced requirements. Sample application forms that supplement the Zoning Code and Subdivision Code approval procedures have been prepared. The sample forms provide the basic submittal requirements needed for each approval procedure and can be modified to meet the specific needs of your community.